Car seats, computers (the back-up, thereof) and carbohydrates this Sunday. 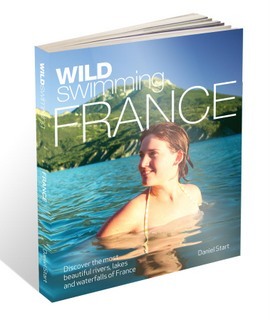 Oh, and a bit of skinny-dipping too for good measure (though it's hardly the weather!). Once you've found them, fitting the seat is simplicity itself and the ISOFIX receptors make a satisfying 'clunk' as they click home. And once they do, you're safe in the knowledge that the seat is safe and secure. And - in the case of the Trifix - comfortable too with plenty of added protection built in. Here's how Which? tests child car seats. Be warned - the footage is quite harrowing, in spite of using crash test dummies. But when you've seen it, you want to know that the seat you've got is among the best. And I'm certain that this one is. 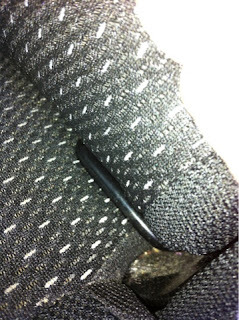 I've never been 100% confident in the safety (or my competency) in threading a seat-belt through slots in the back of a car seat. And with Isofix, this isn't a problem. The Bubblebum inflatable car booster seat now includes a new shoulder belt positioning clip making it even safer and weighing in at just over one-and-a-half pounds it'll both fit in your suitcase and ensure you stay within your baggage allowance. 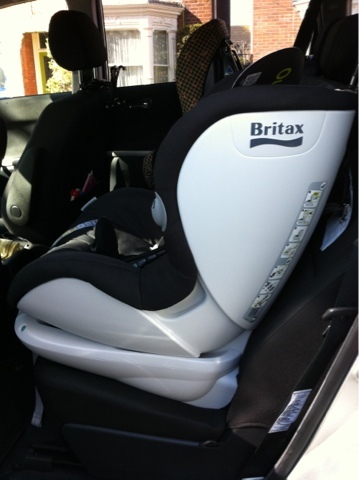 Winner of numerous awards, this group 2-3 seat is the perfect solution when travelling with children. And now for something completely different. Having had a Power Book G4 die spectacularly on me recently this next item is especially relevant. Even without dramatic hard-drive failures like the above, you can’t have young children and do any kind of work on a computer without risking everything. You're courting disaster every time they hear the windows chime. The other day, in a quiet moment with one at school, another nursery and the third asleep, I’d got about 1000 new words of a new book proposal written. Then Eloise woke up; Charlie needed fetching. By the time I got back home the supper needed prepping; Sally arrived home shortly afterwards, followed by Sarah, Then we ate. Then it was bathtime. Then bed. Then – hours later – I remembered the doc I hadn’t saved on the laptop not plugged in, the one whose battery was about to expire five hours earlier. The little message you get in the bottom right hand corner of your screen several times a day tells your stuff is safe, backed up and secure. 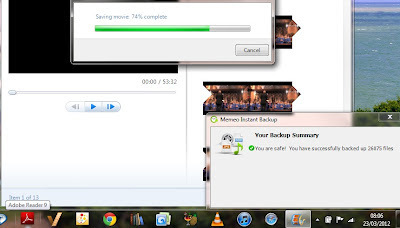 You see, you don't actually 'run' a backup at all. It's running all the time in the background, as unobtrusively and effectively as, well, the most efficient secretary. Finally, we all know that swimming makes you hungry. Well, here's a possible solution. We were asked to try the new Frankie and Benny's menus recently, a difficult job I know but someone has to do it. Although other members of the family have all been at various times before, for some reason I seem to have missed out. This was my first ever trip to a Frankie and Benny's - but it won't be my last. They say they pride themselves in offering customers 'a wide range of dishes' and with not one, but four new menus on offer that's certainly a valid claim. 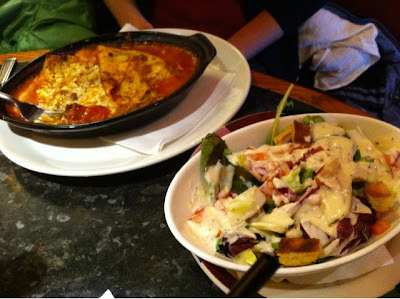 We found plenty to choose from, opting for the Lasagne al Forno (pasta sheets layered with Cousin Mario’s beef ragu, creamy béchamel sauce and mozzarella cheese) and (in my case) something called a 'Black and Blue' which was essentially burger glazed with melted blue cheese and served with lettuce, tomato and dill pickle. According to the menu it also comes with spicy onion rings although they were absent from my plate yesterday and I've only just - in checking the menu - realised. Pity. 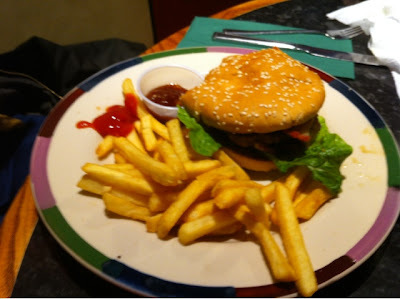 Because otherwise the service - and the food - was excellent and we were especially impressed with the value and quality of the children's meals - just £3.95 for a main, a desert and refillable soft drink! 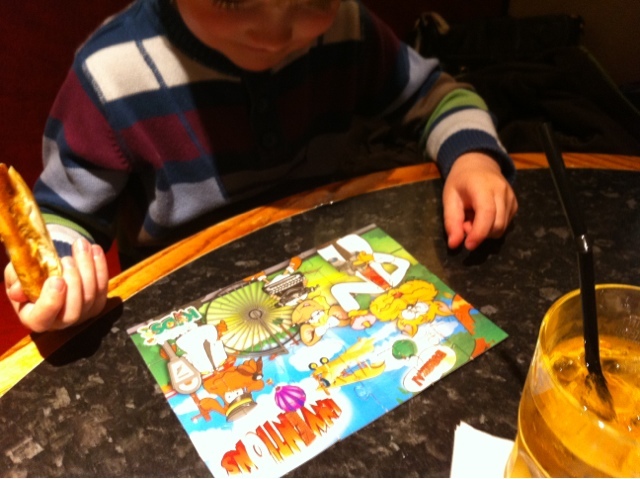 Oh, and should you need the 'bathroom' (as the Americans say) you get the chance to learn a little Italian, too - a fact which amused Charlie almost as much as the first-class fun pack (pencil, puzzle book and jigsaw) that kept him quiet while waiting to be served. Which wasn't - in spite of it being a busy Saturday in Spalding - very long. As I said, I'll certainly be back. If only to claim my onion rings. Have a great Sunday. And don't get too wet! Ah... Professor Alice...! I have started my day with a warm glow. OMG that Bubble Bum looks great, my boys would love it! I especially love the fact it comes with the belt clip for extra fitting. All the boosters I have are ok but the belt never fits properly and my boys have taken to putting the belt under their arm so it fits better and doesn't get in the way!